Revoice Pro is one of those rare applications that's genuinely unique: no other software or hardware is capable of doing everything it can do. 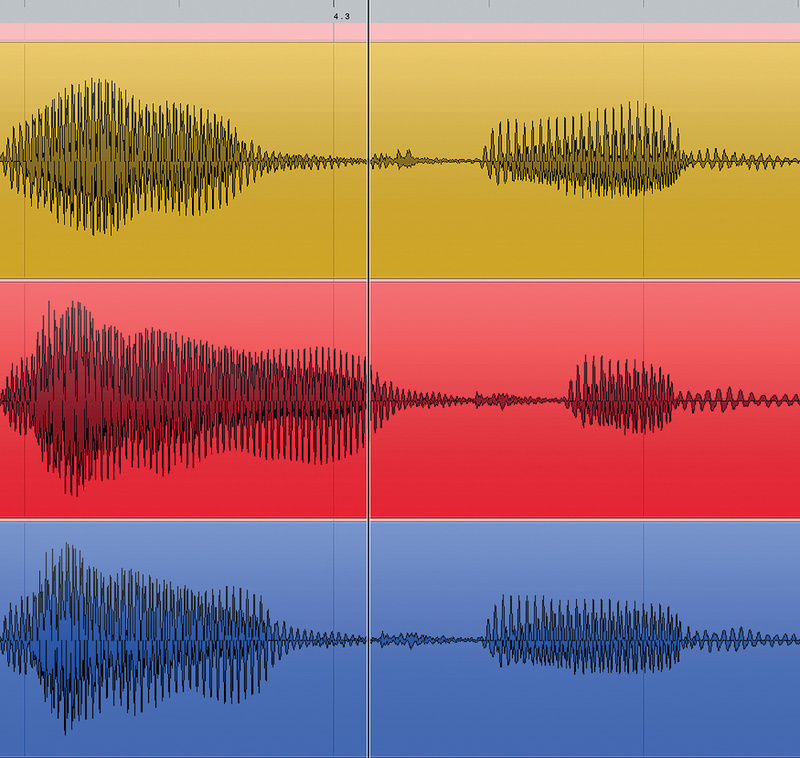 There are plenty of pitch- and time-correction processors, of course, but only a handful that can generate convincing fake double-tracked vocals, and even fewer programs that can impose the timing of one vocal part on to one or more others. Cakewalk has had a VocalSync function for a while, and a vocal time-alignment facility was added in Steinberg's Cubase Pro 10; however, although the latter is impressive for a bundled DAW feature, I've not typically managed to achieve the same quality of results using that as I've obtained using Revoice Pro. Of course, there's nothing in Revoice Pro that can't be accomplished manually in any half-decent DAW, but doing so takes time and effort. While the asking price of Revoice Pro is not exactly trivial, it could earn its keep very quickly in a professional music-production or film/TV post-production setting, whereas serious hobbyists might find that it leaves them with less 'left-brain work' to do, and more time to focus on the music. 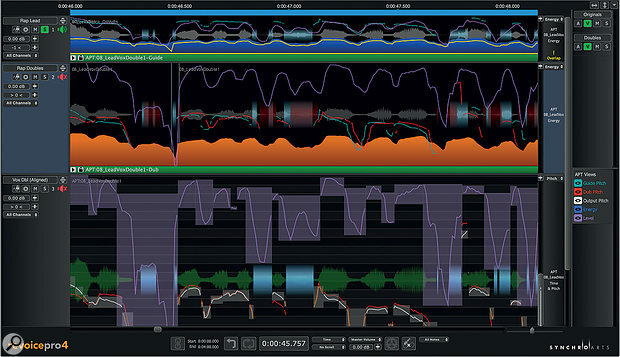 Until now, the biggest leaps in Revoice Pro's evolution occurred during versions 3.0 to 3.3, and if you want to find out about how this software works more generally, check out Sam Inglis' review of Revoice Pro 3 (www.soundonsound.com/reviews/synchro-arts-revoice-pro-3) and my series of Revoice Pro 3.2 workshops (www.soundonsound.com/techniques/revoice-pro-32-masterclass-part-1). Revoice Pro 4 is the most significant update in ages, and I'll focus in this review on what's new. The version I evaluated for this review was v4.0.0.26, and I'll refer to it from hereon as 'RVP4'. 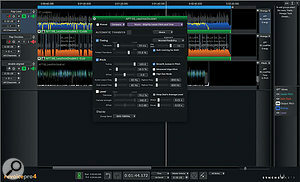 Headline improvements include an ARA2 plug-in, which enables deeper integration with any DAW that supports that format. At the time of writing, this includes Studio One, Logic Pro and Cakewalk, and it's already in beta for Reaper. Steinberg have also announced plans to implement it in an update of Cubase Pro 10 (and presumably in Nuendo too, at some point). There have also been improvements to the process Synchro Arts call Audio Performance Transfer, whereby RVP imposes the pitch, time and level of one part on to another. These include the provision of new APT algorithms specifically for musical material (the software has its origins in dialogue replacement for film and TV), and the ability to map the timing characteristics from a guide part (as before) but later pitch-correct the output from that APT process relative to a reference scale rather than the guide. The Warp Region function, which is used when you wish to manipulate the pitch, time and level of notes/phrases in an audio clip manually, has also received some useful upgrades. Less obvious workflow improvements include the faster redrawing of some graphical elements, new shortcuts that allow you to perform existing actions in fewer clicks, and new facilities, such as being able to save a duplicate project for archival, complete with copies of the audio files. A nice touch is the introduction of drag-and-drop grouping of tracks, with the resulting groups allowing you to show, hide, solo and mute bunches of tracks in one click. For instance, with suitable grouping, you could solo the results from all your processes, but mute and hide the originals, all in three clicks. There are various other small but useful tweaks, such as the ability to resize some windows and panes you couldn't previously — most notably the left pane, which contains the track names and main controls, and the right pane, which contains the groups and various controls that determine what's displayed in the central pane. 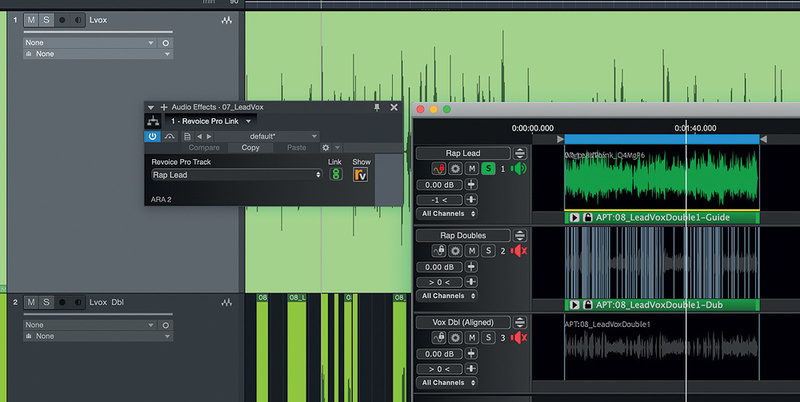 New APT view options allow you to decide what 'traces' are displayed on the waveform. There are literally dozens of such small changes — far too many to list here, but full details are in the online manual's Release Notes: www.synchroarts.com/AppSupport/RevoiceProV4.0/Manual/ReleaseNotes.html. Despite all this change, users of previous versions should find everything reassuringly familiar. The GUI has the same look and feel, with no confusing new windows, no new workflows being forced on the user, and all the old default key commands still working as you'd expect. Speaking of key commands, these can now be customised — a welcome improvement — though do be aware that you're not warned you if your chosen key command is already assigned to an OS function (in hindsight, Command+V was not the best choice for creating Vibrato Warp markers!). RVP4 uses a new project file type which, due to the new functionality, previous versions can't open, but RVP4 can open projects created in previous versions. All in all, things just feel generally a bit slicker and that little bit better; it's a product that is finally reaching maturity — though I'm sure there's better still to come! On installing RVP4, I was informed that there was no licence on my iLok 2 dongle, yet the iLok License Manager utility told me otherwise. A quick look at the FAQs on Synchro Arts' website suggested I update the iLok License Manager. It would have been nice if the pop-up had warned me of that, rather than leave me to research it, but with the update done, RVP4 opened. Another pop-up then told me I was missing a couple of required plug-ins, but clicking OK installed them and all was well. It's worth noting that while it's possible to install RVP4 over previous versions, it might not work properly if you do, because the plug-ins may open the wrong version of the application — so if you're demo'ing RVP4, it's recommended to uninstall previous versions and keep your installers handy for later reinstallation. RVP4 has several related elements. At heart, it's a stand-alone application, and you can still choose to use it as such, simply dragging and dropping audio clips from your DAW, processing them in RVP4, and dragging the results back. The audio is automatically 'spotted' on the RVP4 timeline, and most DAWs have a command for spotting time-stamped files too, though they use different terminology (for example, Cubase and Studio One call it 'Move To Origin'). Though it's much easier to use the stand-alone version than you might think, and I was happy enough using RVP3 like this, Synchro Arts have created a range of plug-ins to make integration with your DAW more seamless. 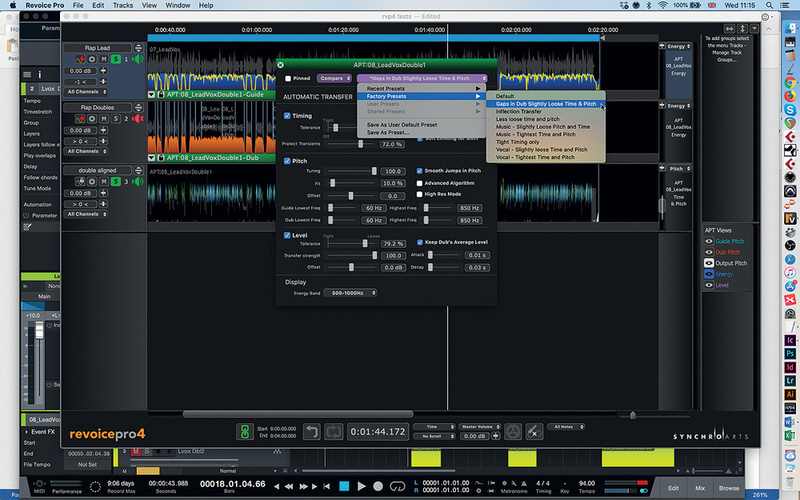 Audiosuite plug-ins for Pro Tools allow you to apply presets such as creating a fake double-track, or time-aligning one clip to another without ever leaving the DAW; you only have to open RVP4 if you need to change the presets you wish Pro Tools to apply. The VST and Audio Units plug-ins perform different functions, allowing you to capture audio to RVP4 in real time, sync RVP4 to your DAW's transport controls, and stream audio from RVP4 to a track in your DAW. Revoice Pro 4 being used via the ARA2 plug-in in PreSonus Studio One. So far, the audio you hear on playback resides in RVP4; the waveform in Studio One doesn't reflect any changes you've made and can't be edited. If you select the clips/tracks in Studio One and execute the DAW's Render function, though, all the RVP4 processing is brought into the DAW, and the corresponding part is removed from RVP4. It really is very slick. Some processes require additional tracks, of course, and you can return these to new tracks in the DAW in a number of ways — I tended to use the Shift+Option-drag (drag-and-drop) function. There are just a couple of niggles. First, while the ARA2 plug-in can launch RVP4 and create a new project, you still have to go in to RVP4's settings and manually update the tempo, frame rate and timeline offset to match you DAW song/project. There are good reasons these things need to be matched, but it would have been nicer if the plug-in could create an RVP project with those settings already populated — though perhaps that's a limitation of the ARA2 standard? Second, the dynamic link with the DAW means it's possible to wander inadvertently into 'loops of confusion'. For example, if you close the RVP4 project or delete a clip that the DAW's ARA2 plug-in generated in RVP4, the DAW will automatically relaunch/recreate it; that can leave you scratching your head until you realise what's happening! But these are minor issues, and for the most part the ARA2 integration is most welcome. The biggest new feature that comes under the 'Warp' heading is called Vibrato Warp. It's really impressive, in part because it's innovative but primarily because it's effective. Used just like the existing warp markers, Vibrato Warp markers give you control over a singer's vibrato rate separately from any time stretching/compression. Normally, of course, the vibrato rate increases as you time-compress a note and decreases as you stretch it, which can make it easier to spot that a vocal has been processed. This new function is easy to use and the results sound good. When first exploring RVP3.2, I suggested to Synchro Arts that it would be good if it could host plug-ins, or at least include a de-esser, de-popper and de-breather. 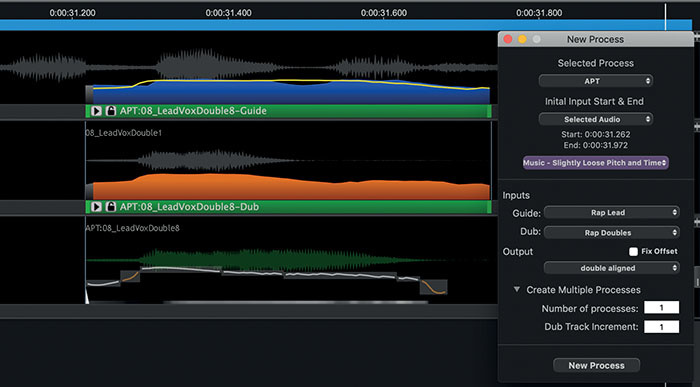 This would allow the user to perform all his or her vocal editing/cleaning in RVP, instead of performing some operations in the DAW before rendering them to new clips for export to RVP. It seems Synchro Arts were listening, because RVP4 can identify breaths and esses in a Warp Region. Once you've created a Warp Region, hit the 'S' key and they'll be highlighted with pink traces. You can manually drag to adjust the level of each ess/breath, or Option-drag to boost/attenuate in 3dB steps. This is a welcome addition. I've always found editing and adjusting clip gains to be an effective approach to de-essing and editing breaths. RVP4 makes this easy, and I can do it in the same 'pass' as any manual pitch correction, making it less onerous a job than you'd imagine. Even if you don't achieve perfect results, a de-esser plug-in will have a less challenging job later on. Revoice Pro can now identify and highlight unpitched vocal elements such as esses and breaths, and allows you to click and drag to attenuate them — the default pink line can be changed to a more obvious colour if you prefer. I have only a couple of small criticisms. First, the pink line of the ess/breath 'notes' perhaps isn't the most obvious contrast to regular notes' purple lines; thankfully, you can change the colour in Preferences. Second, RVP4 doesn't distinguish between esses, breaths and other non-pitched sounds; you have to listen to each one and decide if changes are required. Presumably that's why I could find no way to select all these 'notes' and adjust their level collectively. Intelligently identifying esses, breaths and so on separately is a rather bigger ask of an algorithm, but perhaps it's something that can be explored in the future? These three screens demonstrate the importance of choosing or refining the algorithm to suit the material. The example comprises a rap lead and a double, with the double only emphasising certain words and syllables so there are some gaps. 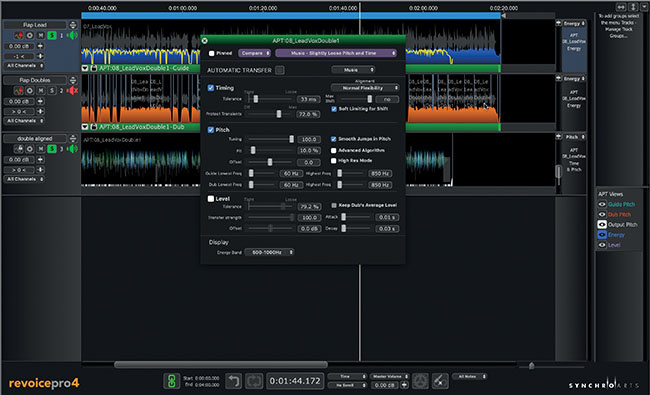 The first two screens show the result of applying the 'Music - Slightly Loose Pitch and Time' APT preset: notice how the 'aligned' part is much shorter overall than the original. The close-up shows where RVP has attempted to align one syllable of the dub to two syllables of the guide. The third screen, though, shows an almost perfectly aligned double — the result of the 'Gaps in Dub - Slightly Loose Time & Pitch' preset. I mentioned that there are some new APT options for musical material. For example, where before we had 'Slightly Loose Time & Pitch' now we have an option of 'Music Slightly Loose Time & Pitch'. To be honest, the old algorithm usually worked well enough on most sources, but the new one does too. Certainly, I could discern no audible artifacts when using it on suitable material. For aligning the pitch and time of doubles and backing vocals singing the same part as the lead, for example, it generally worked superbly, and using it to tighten just the timing of simple backing vocal harmonies (by unticking the preset's pitch section in the APT pop-up) yielded similarly pleasing results. Note, though, that as with most time-stretching software, to achieve the best results, you should audition different presets or tweak the chosen preset. For instance, when trying to align a rap lead vocal with a double that emphasised only certain words and syllables, most presets gave me very strange results. It was a while before I noticed the 'Gaps in Dub Slightly Loose Time & Pitch' preset, which worked flawlessly. Comparing this preset with others revealed that the Max Shift setting was the offending variable in the other presets. Making such comparisons between presets is a great way for RVP virgins to learn how to refine the results of APT settings. There is much more that's worth investigating in Revoice Pro 4, but I hope I've been able to convey a sense of what's on offer here. If you work in ADR or do lots of music work with stacked vocal parts (or, in fact, other instrument doubles — it works very well on bass, on guitar and various other sources) this tool could prove indispensable. It remains among the best-sounding pitch processors out there, and when it comes to time alignment, it's in a class of its own. The many small — and not-so-small — improvements should easily justify the upgrade price for most users, and most definitely will for anyone with a DAW that supports ARA2. As explained in the main text, nothing else can do everything that Revoice Pro can. When it comes to time alignment, Synchro Arts' own Vocalign can do the same thing, and both Cakewalk and Cubase 10 build in tools that take slightly different approaches to the same problem. Cubase's VariAudio can also create good fake double tracks, as can Celemony Melodyne, which is also compatible with ARA2 hosts, and offers a few tricks that Revoice Pro doesn't — though not the time-alignment functions. As a long-time Cubase user, I was keen to discover how well its new time-alignment algorithm compared with the ones in Revoice Pro 4. Each system has its advantages. 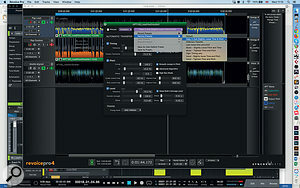 Cubase makes use of its existing audio warp facility, and for the most part this works well. The changes you make are reflected in the waveform in the DAW, and the warp markers used in the automatic time alignment remain available for manual tweaking in your project. It wins hands-down in the DAW-integration wars, as you'd expect. 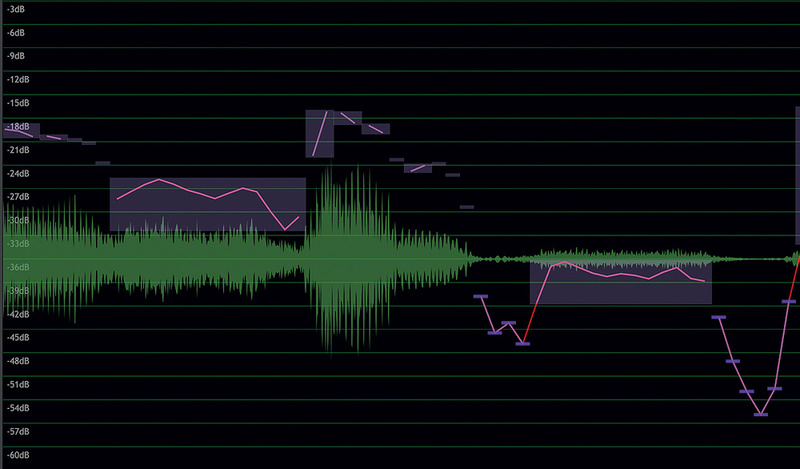 But Revoice Pro delivers better results: its algorithms seem to be able to match timings that bit better. It's not that Cubase usually does a bad job — far from it — but RVP can do an outstanding one. By way of example, check out the screenshot, which shows a 'guide' part (top/yellow), the result of time-aligning a 'dub' using Cubase 10 Pro (middle/red), and the result of time-aligning the same dub using Revoice Pro 4 (blue). The part is a rap and this section features the lyrics "take it". Both applications have aligned the start and the end of the phrase, but notice the position of the small 'k' sound in between the higher-level parts of the waveforms, and of the start of the word 'it'. In several tests, Revoice Pro exhibited greater timing accuracy than Cubase with such low-level details. Still creates convincing fake doubles. Can now identify esses and breaths. Various GUI and workflow improvements. No distinction between esses and breaths. Would be nice if the Revoice Pro project's settings could be automatically matched to those of the DAW when using ARA2. The previous version of Revoice Pro was already a highly effective pitch‑ and time-alignment processor. 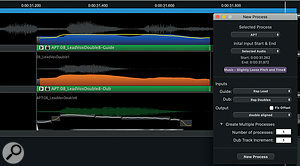 Now it's even better, and boasts deeper integration with many DAWs.